Interior Minister Christophe Castaner Casataner estimated there were 10,000 yellow vest protesters in Paris on Saturday, among some 125,000 protesters around the country. France's interior minister says the protest violence in Paris is "under control" despite scattered tensions, but is calling it "totally unacceptable." Interior Minister Christophe Castaner says 135 people were injured in the protests Saturday, including 17 police officers. He says "exceptional" security measures led to police putting nearly 1,000 people in custody. 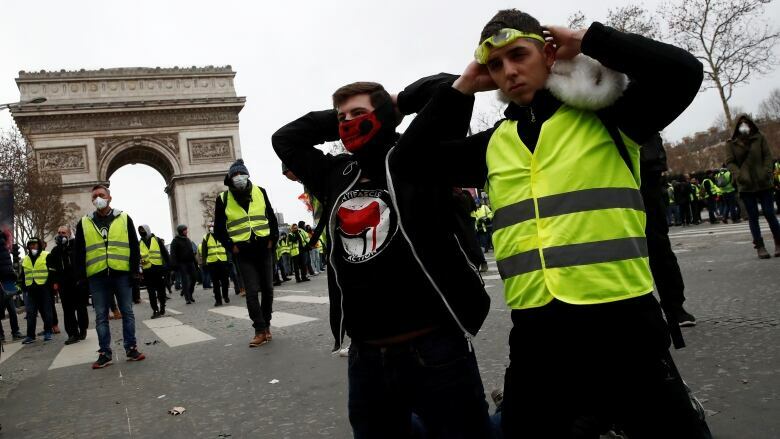 Police were searching people throughout zones of central Paris and confiscating goggles and gas masks from journalists who use them to protect against tear gas while covering demonstrations. Police barred some provincial "yellow vest" protesters from boarding trains to Paris in an effort to prevent a repeat of last week's rioting. 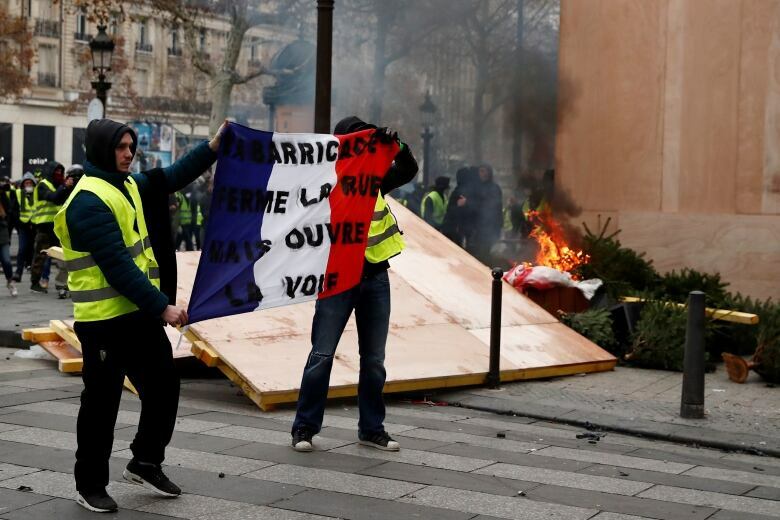 A group of four protesters who came to Paris from Normandy on Saturday said they saw people wearing yellow vests turned away at train stations all along their route. They said fellow protesters trying to reach Paris from Toulouse in southern France reported the same problems. A national police spokesperson said officers stationed at train stations around the country are under orders to verify all passengers and turn away any carrying equipment that could be used to "cause damage to people or property." Last weekend, more than 130 people were injured and over 400 were arrested in the worst street violence seen in Paris in decades. Since the unrest began on Nov. 17 in reaction to a sharp increase in diesel taxes, four people have been killed in violence related to the protests. The ongoing protests have led Global Affairs to issue a travel advisory to Canadians travelling to France. It's telling them to avoid areas where the demonstrations are taking place because "acts of vandalism and violence are very likely."